This article first appeared at American Lens News on July 11, 2017. At the end of June, the North Carolina General Assembly announced the names of legislators to be involved in the redistricting process for the state. Rep. David Lewis (R-Harnett) and Sen. Ralph Hise (R-Mitchell) will co-chair the committee. House Vice-Chairs will be John Bell (R-Wayne), Sarah Stevens (R-Surry), Darren Jackson (D-Wake), John Szoka (R-Cumberland), John Torbett (R-Gaston). The breakdown of members in the House by party is 21 Republicans and 16 Democrats. In the Senate, there are 9 Republicans and 5 Democrats. The full list of members of the panel can be found at the bottom of this article. Before adjourning, legislators said that they would conduct a redistricting session no later than November 15th, 2017. The districts in question are the 1st and the 12th. This will be the 6th time the 12th district has been redrawn. The redistricting committee was required to be formed after the Supreme Court upheld a lower court’s ruling that struck down the state’s 1st and 12th congressional districts as racially gerrymandered and upheld the related decision by a 3 judge panel over disputed legislative districts. The legislative district case is Covington vs North Carolina. In that case, numerous legislative districts were ruled by a 3 judge panel to have been drawn with race being the predominant factor. U.S. Supreme Court upheld the Covington case ruling, yet sent the case back to the trial courts. The Supreme Court did not, however, uphold the 4th Circuits ruling that the state must hold a special election in 2017. Lawmakers filed a document on June 6th in the state’s U.S. District Court middle court. The state’s filing contends that two-thirds of the districts in the state will be impacted. The filing states that the court’s order to redraw electoral maps in the challenged districts would have ramifications for 81 of 120 House seats. The filing also says that 35 of 50 Senate seats would be impacted. Creating new boundaries for the challenged districts would, of course, alter and impact any adjacent district. The filing contends that the cost would likely be at least $20 million. The ruling affirmed that state lawmakers had put too many African-American voters into those districts, and had the effect of minimizing the presence of black voters in neighboring districts. Justices Alito, Kennedy and Roberts dissented on the 12th district ruling. All three-sided with state officials that the 12th district was drawn to help Republicans, but not to disenfranchise black voters. In essence, the Supreme Court affirmed that the maps in the two congressional districts used race too much in drawing the maps. “The Supreme Court says race can be a factor in redistricting but not the predominant factor, a rule that is so vague, so broad, and so lacking in a definable legal standard that it is not really a rule at all,” said Hans von Spakovsky of the Heritage Foundation. It doesn’t just seem like Democrats are in panic mode over redistricting – they really are and with good reason. According to the data compiled by University of Virginia professor Larry J. Sabato, Democrats losses during the Obama era were massive. Sabato’s tally shows that Democrats lost 13 Senate seats, 69 House seats, 913 state legislative seats, 11 governorships and 32 state legislative chambers between 2008 and 2015. Eric Holder, former attorney general under President Obama is chairing the National Democratic Redistricting Committee (NDRC). Holder remains the only attorney general in U.S. history to be held in contempt of Congress. “This is a watershed moment in the fight to end racial gerrymandering. Today’s ruling sends a stark message to legislatures and governors around the country: Racial gerrymandering is illegal and will be struck down in a court of law,” Holder said about the Supreme Court ruling. Joining Holder as co-chair is Kelly Ward, who was just recently the executive director of the Democratic Congressional Campaign Committee (DCCC). President of the NDRC is the Democratic Governors Association executive director, Elisabeth Pearson. In addition to Pearson, House Majority PAC executive director Ali Lapp serves as vice president. In 2014, the DCCC said it would commit $70 million to a program they call Advantage 2020. The program targets legislative chambers in key states over the next four election cycles. Advantage 2020 was set up by former representative Mark Schauer (D-MI), who is now working as an adviser to the NDRC. The specific aim of Advantage 2020 is the same as the NDRC: influencing redistricting. North Carolina is on the list of key states, as are Florida, Michigan, Ohio, and Pennsylvania. This coming weekend, the North Carolina Democratic Party is hosting their Unity Dinner. 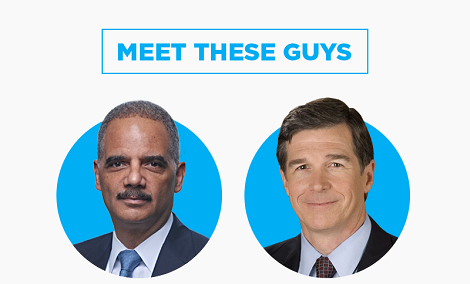 It is likely no coincidence that the keynote speaker is Eric Holder and the dinner will also feature remarks by Governor Cooper. The NDRC, formed in August of 2016, is a 527 organization under supervision of former President Obama and the White House. This type of 527 organization is formed to influence elections processes and to appointment or defeat of candidates at the federal and state levels. The narratives in use by the NDRC are not new – ‘Republicans are extremists that can only win by fixing the playing field’ (i.e., gerrymandering). The NDRC’s rhetoric seems less about fixing redistricting, and rather more about Republican bashing. The group is a well-funded war machine being employed in order to sue and pressure states with maps they don’t like. North Carolina has become well-acquainted with the sue-happy Left and with their top attack lawyer, Marc Elias. Elias has joined the NDRC as an adviser. Marc Elias was special counsel to Hillary Clinton’s campaign. Elias also represented Roy Cooper’s campaign when former Governor Pat McCrory had called for a recount. Much like the NC Democrat Party’s Unity Dinner, the NDRC is about fundraising big money. A lot of it. Other funding for the NDRC is likely coming in large part from dark-money giant, Democracy Alliance and its web of partner non-profits, who are essentially money launderers for left-wing causes. Earlier this year, the NDRC showed up at a summit hosted by the Democracy Alliance. Most noteworthy, Democracy Alliance has poured millions into progressive and leftist groups, including Blueprint NC. The organization has been funding far left groups in North Carolina going back as far as 2005. According to planning documents obtained by the Washington Free Beacon, North Carolina is a ‘priority’ and ‘challenge’ target for Democracy Alliance. This article has been updated to clarify the redistricting committee was formed in relation to legislative state districts and not congressional districts. This entry was posted in Am Lens, ELECTIONS, NCGA, POLITICS NC, SCOTUS and tagged Harris v. McCrory, Redistricting, SCOTUS. Bookmark the permalink.